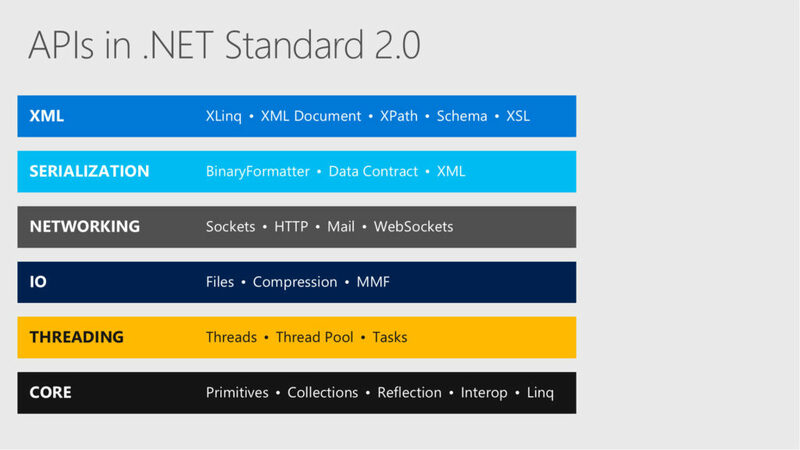 Last week Scott Hunter and Scott Hanselman announced the release of .NET Core 2.0 preview 1, mid presentation. There’s a long list of changes in .NET Core 2.0 and ASP.NET Core 2.0. I’m going to try and cover some of the most significant and interesting changes that were announced at Build 2017. I’ll then go into more detail with some of them over a series of posts. So stay tuned. was the announcement of .NET Core 2.0. 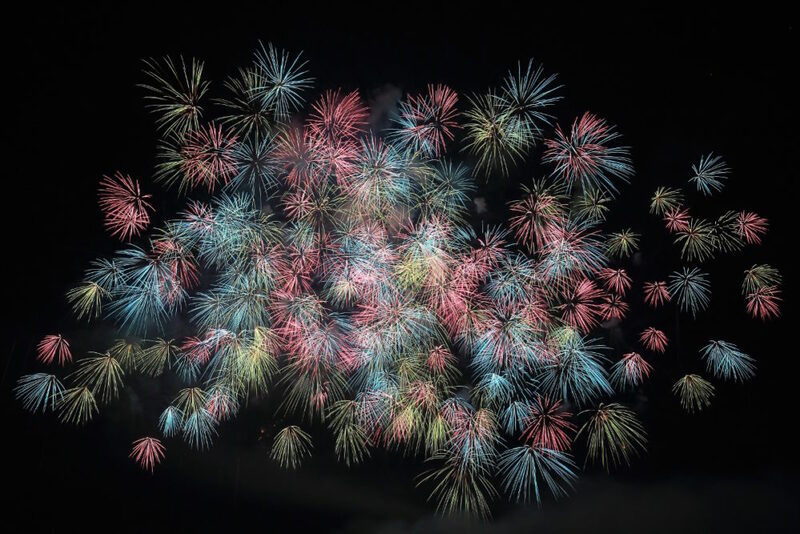 What was actually announced and released was .NET Core 2.0 preview 1, which is more of a taste of what’s to come, as it is not an RTM release and is not ready for enterprise apps to be built in. You can get the installer for the .NET Core 2.0 preview here, but keep reading as there are some things that you’ll need to know. what with it being an early access, preview build and all that jazz. As with the previous releases of .NET Core (and, by the looks of it, the future of Microsoft’s products), the 2.0 preview can be installed side-by-side with the current releases of .NET Core. Say you’re already in the process of building an application with .NET Core 1.0.4, you can still install the .NET Core 2.0 preview 1, and not have to upgrade your pre-existing code base. There’s a slight bit of futzing required when creating projects from templates in the command line, though, but I’ll go into that in a moment. also the full release version of Visual Studio for Mac, both of which have support for the new .NET Core 2.0 preview 1 features. I’ll be putting together a post going into both of these in more detail very soon. .NET Core 2.0 preview 1 is not supported by Visual Studio 2017 Update 2 (known as 15.2). To create and build .NET Core 2.0 applications, Visual Studio 2017 Update 3 preview is required. This will install side-by-side with Visual Studio 2017 Update 2, however, and shouldn’t affect Visual Studio 2017 Update 2. You’ll need a fair amount of hard drive space to have them both installed, though. The full version of Visual Studio for Mac has issues when opening, building and running .NET Core 1.1 applications if the only version of the .NET Core SDK that you have installed is installed is version 2.0 preview. This is because .NET Core 2.0 preview does not contain version 1.1 of the runtime. If you need a quick reminder on .NET Standard and what it is, I’d recommend that you read my article on it from last year. 20,000 new APIs! Just think about that for a second. That’s a massive number. So massive in fact, that days before Build, Microsoft announced (a little prematurely, it has been seen) that .NET Core has evolved a little faster than .NET Standard. Think about it this way. WPF isn’t netstandard2.0, it knows it’s on net461+ and that’s OK. It’s optimized, but it can reference netstandard libs. ASP.NET Core 2.0 is optimize[d] for Core 2.0 but it can reference shared libraries. Xamarin is the same. 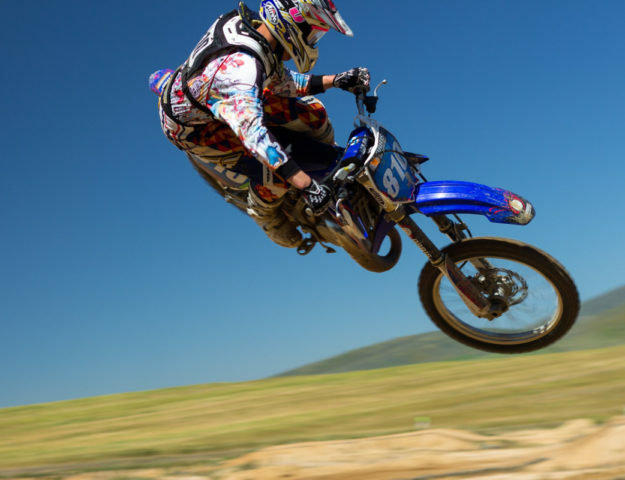 NetCore > Net Standard > NetFx when it comes to development speed and innovation. Point is, if you are doing new work, netstandard20. If you have older net461+ libraries, MOST of those can be referenced under ASP.NET Core 2.0. ASP.NET Core 1.1 which runs on .NET Framework will be fully supported for a year after we release 2.0. That workload is fully supported thru at least July of 2018. The remaining large gaps missing in .NET Core 2 are System.DirectoryServices and System.Drawing. We are working to have a Windows compat pack which would enable both of those on .NET Core on Windows this summer. Since then, Microsoft has issued a statement (via Miguel de Icaza, who is the head of the Mono and Xamarin teams) to The Register stating that ,NET Framework was not going to be left in the dust. It’s worth taking a look through both the original GitHub issue and what Miguel had to say, to ensure that you understand what’s happening. 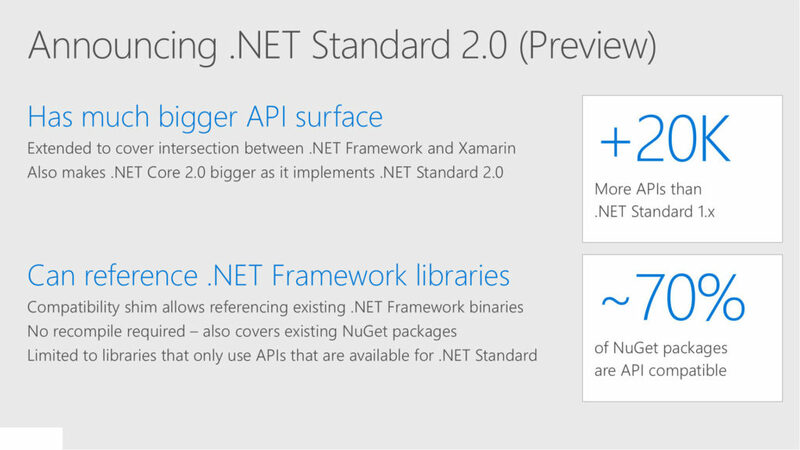 The most exciting thing about .NET Standard 2.0 is that it’s baked into the .NET Core 2.0 preview. So all of the APIs listed in the above image are now accessible in .NET Core 2.0. On top of all of that, Microsoft have released a NuGet package which can be used to allow a .NET Core application to communicate with a .NET Frameowrk 4.7 class library (as long as it complies with .NET Standard). Where Can I Get The 2.0 preview Installer? As I mentioned earlier, the installer for the .NET Core 2.0 preview can be found here. The installer for the SDK contains both the SDK and the runtime. The ‘generic’ Linux binary archives are new for the 2.0 release. This package contains binaries which are compatible with Linux distros and versions supported by .NET Core. This will also enable you to experiment with Distros not present on the supported list but are libc compatible. Technically, as long as a Linux distribution is libc compatible, it can run .NET Core 2.0. I’ll let that sink in for a second. technologies not only being ported to (pretty much) all of the popular Linux distributions, not only running on embedded hardware which doesn’t run Windows, and not only running on MacOS, but also being open source? Let’s take a look at what we get for using .NET Core 2.0 preview over 1.0.4 (which is the current long term support version). we get a whole host of new stuff. In previous versions of ASP.NET Core, we had to explicitly include all of the features of ASP.NET Core that we wanted access to. Things like MVC, Entity Framework Core, Static Files, Routing, Logging, etc. We no longer have to track down the individual API packages for functionality of ASP.NET Core that we want to include, we just need to include Microsoft.AspNetCore.All because it includes it all for us. Both of these build options produced, frankly, massive builds containing dlls for each of the packages that had been referenced in the application. However (and working in tandem with the Unified ASP.NET Core package), we can create smaller builds of our application by utilising the Runtime Package Store. 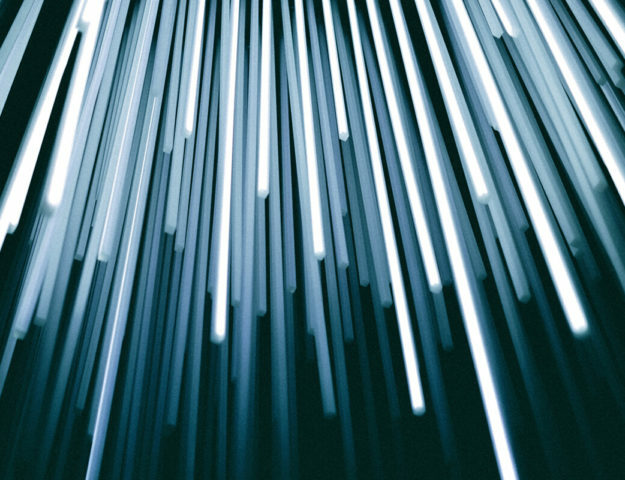 The runtime package store enables creating a precompiled cache of common libraries which can be centrally provisioned and not deployed to every application reducing deployment size and time. The two Scotts showed that a .NET Core 1.0.4 application which had a publish profile of over 16 megabytes of files is reduced to ~2.6 megabytes when using Runtime Package Store in .NET Core 2.0. Smaller builds means less time pushing to the cloud, which means smaller bills (and reduced deployment times). Which makes us all happier. I touched on this earlier, but because the .NET Core SDKs can be installed Side-by-Side, we can still target any of the versions that we have installed. There is a known issue with the first run of version 1.0 of the SDK after installing the 2.0 preview, but it’s covered pretty well on the .NET Core 2.0 preview known issues page. the .NET Core SDK will product a console application which targets netcoreapp 2.0 (.NET Core 2.0 preview). and the SDK will only produce new projects based on the version of the SDK specified in the file. 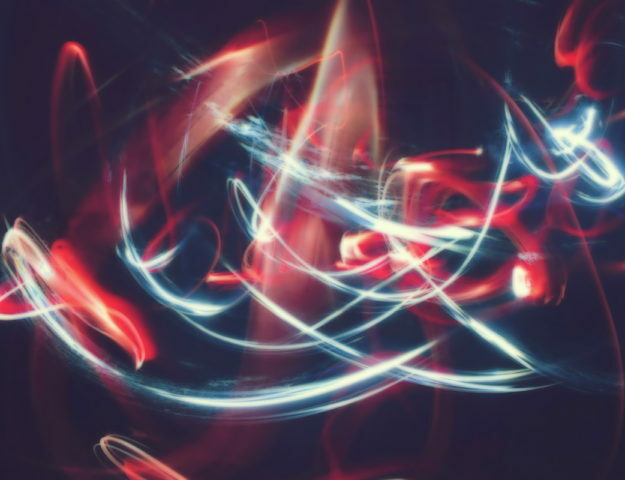 This can be extremely useful when committed to source control, as it will ensure that the correct version of the .NET Core SDK is used at compile time. Which is probably why it’s a convention for .NET Core development. As with previous versions of .NET Core, you can leverage this to have sub-directories which target different versions of the SDK. 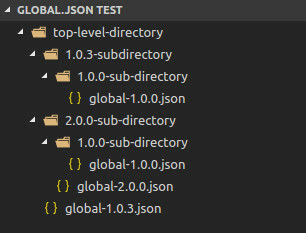 In the above image, I’ve added a selection of different global.json files to different sub-directories. In real life, you would name them all “global.json”, I’ve added version numbers to the names to help show what I’m about talk about. A lot of work has gone into increasing the speed of the first boot of ASP.NET Core 2.0 applications. 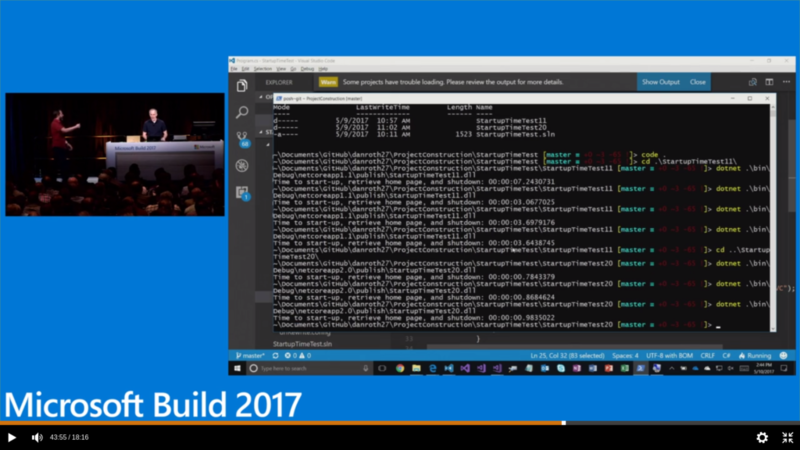 There was an absolutely amazing moment during Scott Hanselman and Dan Roth’s talk (“Introducing ASP.NET Core 2.0“), where Dan Roth showed off the cold boot times of an ASP.NET Core 1.1 and 2.0 application. As you can see from the image above, the cold boot time for an ASP.NET Core 1.1 application bounced between 7.243 and 3.643 seconds. And the ASP.NET Core 2.0 application’s cold boot time was between 0.984 and 0.784 seconds. We’ve done a couple of things. We have a Runtime store now that ships with .NET Core that includes all of ASP.NET Core in it. That Runtime Store has already been cross gen (compiled into native code). Then on publish we enabled view pre-compilation by default. So all the views in the app have been pre-compiled into the assembly. They don’t have to be compiled on the fiy, which of course takes a bunch of time on start up. Since the Runtime Store contains all of the ASP.NET Core code, and it has already been compiled down to native code (and does not need to be JIT compiled from IL to native code), this takes less time to boot and run. There are a lot of exciting things coming out of Build this year, and I’ll be covering even more things next week. We have a new version of the .NET Core SDK, a new version of the .NET Standard, and a more simplified and streamlined way to include ASP.NET Core namespaces. All of that, and our application builds are now smaller and faster to boot.